MAN Truck & Bus has won the inaugural Truck Innovation Award 2019 in recognition of the development of its aFAS Level 4 autonomous driverless motorway safety truck. Awarded by the International Truck of the Year (ITOY) jury, the new prize acknowledges the major technological change that is evidenced within the field of commercial vehicles. 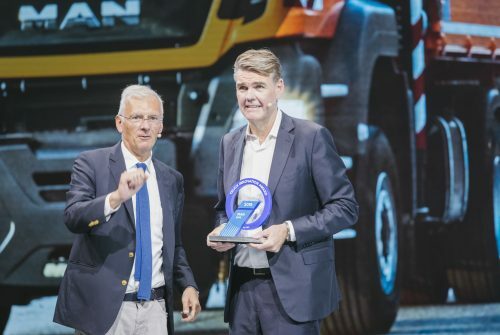 The Truck Innovation Award was handed over to Joachim Drees, Chief Executive Officer of MAN Truck & Bus, by Gianenrico Griffini, Chairman ITOY at the IAA Commercial Vehicle Show in Hannover, Germany. The aFAS – this acronym stands for ‘automated driverless safety vehicle for jobs on Federal motorways’ – is a highly innovative safety solution developed by MAN over a period of four years, with the support of the German Ministry for Economic Affairs and Energy and with the involvement of technical institutions and several key component supplier-partners. According to the criteria, a Truck Innovation Award nominee must be an advanced-technology vehicle, with a gross vehicle weight over 3.5 tonnes GVW. It should either feature an alternative driveline, such as, hybrid, hybrid range-extender, all-electric – or have an alternative fuel-system such as Natural Gas (LNG/CNG), hydrogen/fuel cells. Alternatively, it must also feature specific high-tech solutions when it comes to connectivity – whether semi-or fully autonomous driving systems, a platooning capability, or advanced support services such as remote diagnostics. The MAN Level 4 unmanned safety truck, based on the MAN TGM 18.340 – automatically follows another truck engaged in maintenance works on motorways. The ITOY jury were impressed to discover that the aFAS has already been tested, without any accident, on public roads covering more than 4,000 km. They commented favourably on the fact that the aFAS can save lives, as mobile construction sites on motorways pose a high risk to repair crews, where serious rear-end collisions are common. In addition, they remarked on the fact that this is the first Level 4 driverless vehicle on public roads in Europe.